Susan Papps’ wine story isn’t one of generational custodianship and a family lineage of winemaking. Rather it’s one of new beginnings and a young couple making a conscious choice to forge their own path in Barossa’s wine industry. 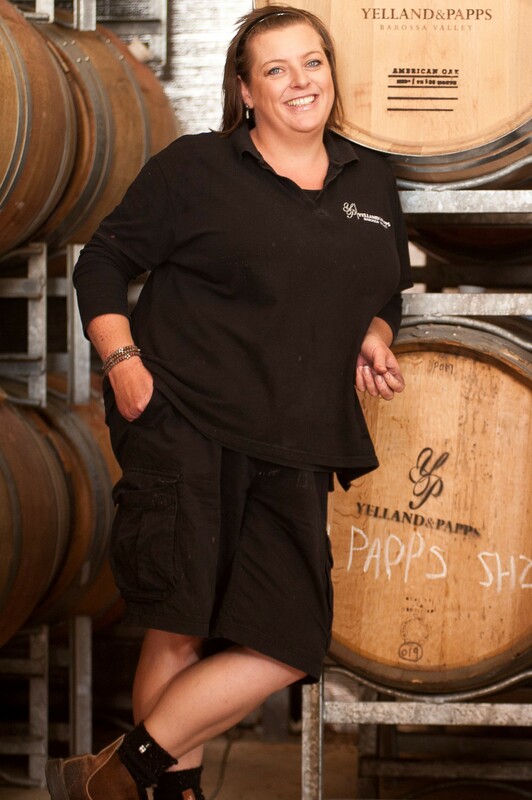 Their winery, Yelland & Papps, now forms part of the new guard of Barossa, a first-generation voice building a legacy for their own children and the region. Susan and husband Michael’s passion and dedication shines brightly in the glass. Their ethos is clear, to be sustainable, small-batch and to champion varieties well-suited to Australia’s most famous wine region; Vermentino, Carignan and Roussanne alongside the traditional favourites Shiraz, Mataro and Grenache. Without the notion of ‘ this is how it was done in our day’ hanging over their heads, the Yelland & Papps story is free to be unique, a little quirky but always focused on creating an exceptional expression of their love of Barossa and sharing something delicious in a glass. Their love of this land is most palpable, though, through their children, 11-year-old Peyton and Campbell, 9. The kids take a proactive approach to life on their 5-acre block, harvesting walnuts, vegetables and figs from their 173-year-old tree for sale in Cellar Door. Peyton’s Verjuice has had quite the local, and now national, following since it began as a small maths project in 2017. Overseeing all aspects of the project, from production to packaging, sales, bottling and logistics it’s been a combination of passion-project, real-life application of learning and confidence builder. To see the fruits of her land and labour appreciated, purchased and out into the world is a wonderful thing for a young girl to experience. Fostering a real connection to the land, what a wonderful life-lesson to pass onto the next generation. Most people would know here at Yelland & Papps we have a pretty deep affection for Grenache and Roussanne, what an amazing collection this is, Barossa is making some extraordinary Grenache and this pack highlights so many different expressions of this awesome varietal, that is very much at home in the Barossa. This would be my first pick of the lot. I just love magnums, put this together with my other love verticals, and you have my bid for this beautiful collection. I remember the day I first tried this wine and who I was with, what a remarkable wine this is, and this is a wine I wish I had more of in my own cellar. Absolute encapsulation of the Barossa in one day, what an experience this would be, this would be a bucket list thing to tick off, and you would have memories to last a life time. Vertical of Riesling by an outstanding vineyard and then to have lunch with the amazing Louisa Rose….priceless! Tickets for the Barossa Wine Auction Live Auction and Lunch are on sale now. An integral part of the Barossa Vintage Festival the 2019 event will be held on 26 April at Lambert Estate Wines, Angaston, SA. Lots ending in L or S will be auctioned at the live event.